In last week’s Let’s Create a Ringtone lesson, I attempted to show you that even musical novices can get value from GarageBand. And many of you grudgingly gave it a go. This week we’re going to create a rockin’ little multi-instrument groove. And yes, if you can click and drag, this is also well within your grasp. That’s because GarageBand includes a collection of loops—audio blocks that you can piece together to form musical phrases. The particular magic of this operation is that you needn’t worry about the speed of your song or creating something where chords and notes are going to horribly clash. GarageBand was engineered so that these loops fit seamlessly together. Let’s give it a go. For this exercise we’ll be using GarageBand along with the content you get with its $5 in-app purchase. If you haven’t yet pungled up for the extra content (and really, you should), follow along using the default collection of loops. Launch GarageBand. From its Projects chooser click on Empty Project and click Choose. When the main window opens and you’re offered the choice to add a particular kind of track (Software Instrument, Audio, Guitar, or Drummer), click on Drummer and then click Create. You now have a project that contains a single track called SoCal. There are two instances of the drum pattern here, with the second beginning where it reads ‘9’ in the ruler. Click on the second one and then press the Mac’s Delete key so that you have just the one instance. Delete the second Drummer segment. In the Search field type in rock and press Return. Now click the Bass button at the top of the Loops pane. Locate the Picked Rock Bass 01 entry and click on it. You’ll hear a bass pattern emerge from your Mac’s speakers. Drag this item to the far left of the workflow area (where it says Drag Apple Loops Here). A blue track will appear that bears the track’s name. 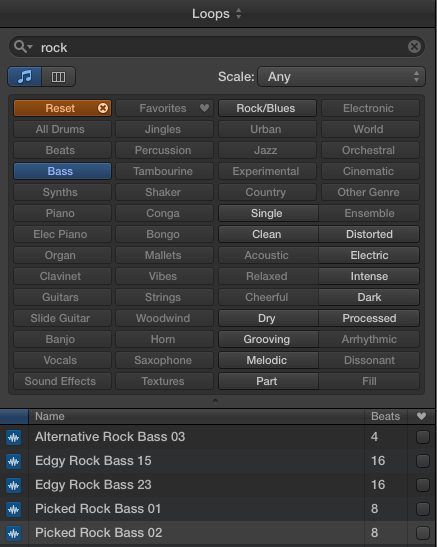 GarageBand stores its musical snippets in the Loops pane. If you now click on GarageBand’s Play button, you’ll hear two bars (eight beats) of that bass pattern accompanied by the drum track. Given that you don’t want to create the shortest groove on earth, click on the track and hover your cursor over its top-right corner. The icon will change to a vertical line that has a half circle with an arrow on the end. This symbol means “repeat.” With that symbol showing, click and drag on the track to extend it to where the ruler shows the number 5. When you do this, you’ll create two instances of this two-bar pattern. That’s good, but the bass player is getting bored. Let’s give her something else to do now by dragging the Picked Rock Bass 02 pattern so that it falls directly after the first bass loop. As before, drag the top-right edge to double its length so that it ends at the beginning of measure 9. Now click the Cycle button that appears just to the right of the display to turn on cycling. The button will light up and a yellow bar will appear in the ruler. Drag the right side of this bar so that it too ends at 9. When you click on GarageBand’s Play button, those eight bars of drums and bass will play and, at the end, cycle back and repeat the pattern until you click the Stop button. GarageBand's Cycle and Loops buttons. While it’s playing, once again click the Bass button in the Loops pane and then click on Guitar. Click on the Modern Rock Guitar 07 entry that appears in the list below. In a short time you’ll hear that pattern play right along with your drums and bass. Click it again to stop it playing. Click on Modern Rock Guitar 09 to hear how it will sound. Click again to stop the preview. As with the bass track, you’ve created some variation within the guitar track. The two guitar loops work with the existing drum and bass tracks, but you’re not hearing the same thing over and over again. There’s some variety between the two, which makes for a more interesting groove. Finally, click on Guitars to turn it off, and enter power station into the Search field, and press the Return key. From the results below, drag the Power Station Arpeggio loop into the workflow area. Double its length by dragging its top-right edge. You’ve just nicely fattened up your project. And with that, you’ve got your groove on without knowing one end of a guitar from the other. Let’s now do a couple of things to make it groovier. Select the drum track and click the Solo button (the one that shows the image of headphones). You’ll now hear just that track. It’s not bad at all, but we can punch it up a bit. 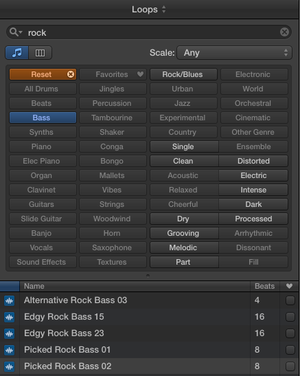 Choose GarageBand > Preferences, choose Audio/MIDI, and enable the Global Echo and Reverb option. Close the Preferences window and click on the Smart Controls button in the control bar (or select View > Show Smart Controls or press the Mac’s B key). The Drummer track’s smart controls appear at the bottom of the window. Adjusting the Drummer track with Smart Controls. Play the track and adjust the Reverb Send knob so that it’s pointing at the 1 o’clock position. Let’s also make the bass drum a little more pronounced by adjusting the Kick knob so that it points to 3 o’clock. The Hi-Hat could be a bit more forward in the mix as well, so adjust that knob to the 2 o’clock position. Now select and solo the bass track and unsolo the drum track. Move the bass track’s Low EQ knob to the 3 o’clock position. Unsolo the bass track so you can hear all of your tracks. In the track list select the guitar track and twiddle its pan knob to the left so that it points to 10 o’clock. Now select the power station track and adjust its pan to the 2 o’clock position. You’ve added a bit more “space” to your groove by changing the position of these tracks in the stereo field. Your finished tracks should look like this. Finally, use the volume sliders within each track to mix the four tracks to your satisfaction. Keep an eye on each track’s meters. If they show red on the far right side nearly all the time, the track is too loud and could distort. Back off the volume on all the other tracks and try again so that the loudest tracks very rarely shows red. Then check the master volume meter within the control bar. Again, you want this to show yellow but rarely red. And that just about does it. Feel free to continue to tweak your tracks as much as you like. Add or subtract reverb, play with the smart control settings, and add other loops. Now that you know how to assemble a groove entirely from loops, you’re well on your way to creating your own dynamic tunes.